We are always interested in hearing from prospective career minded individuals who have passion to work in team and drive to grow together. 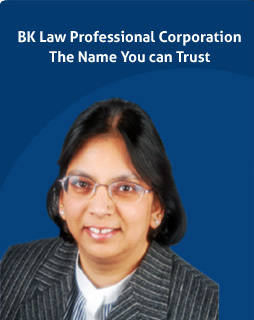 I have dealt with Balvinder Kumar, Barrister, Solicitor, & Notary Public for my Real Estate Law and Incorporation matters and I find her knowledge and efficient service in these matters extraordinary. I will not hesitate recommending her for a real estate lawyer and any other legal service she is providing. Thanks and appreciate your help in my legal matters. We enjoyed meeting with you today and finalizing this very important aspect of our family clarity of our wishes in case of serious health issues such as loss of capacity to manage family affairs and death. My procrastination in keeping these documents made it difficult for my family to access funds necessary to keep our affairs in order. Thanks for your help in making these issues easy to understand and removing the stress caused by the lack of clarity. © 2007-2019 BK Law Professional Corporation, All rights reserved. Website design by Infinite Softech Inc.